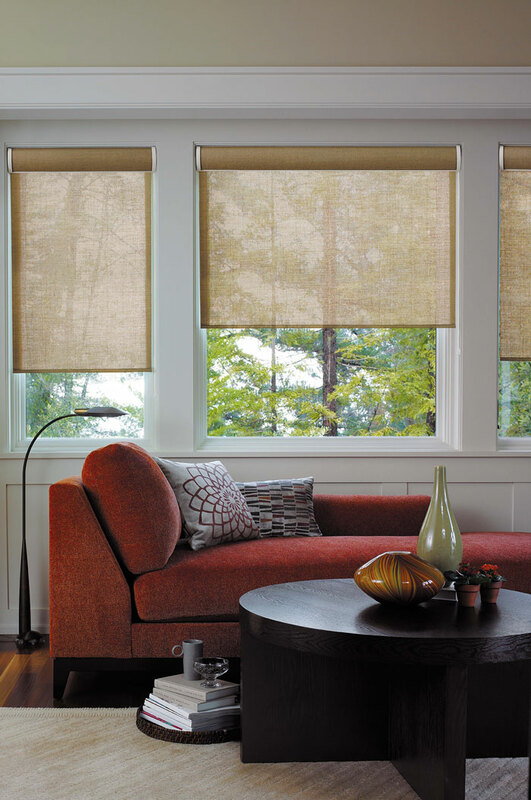 Shades are made of fabric material, that pleat or fold up, and stack at the top by a number of lift options. 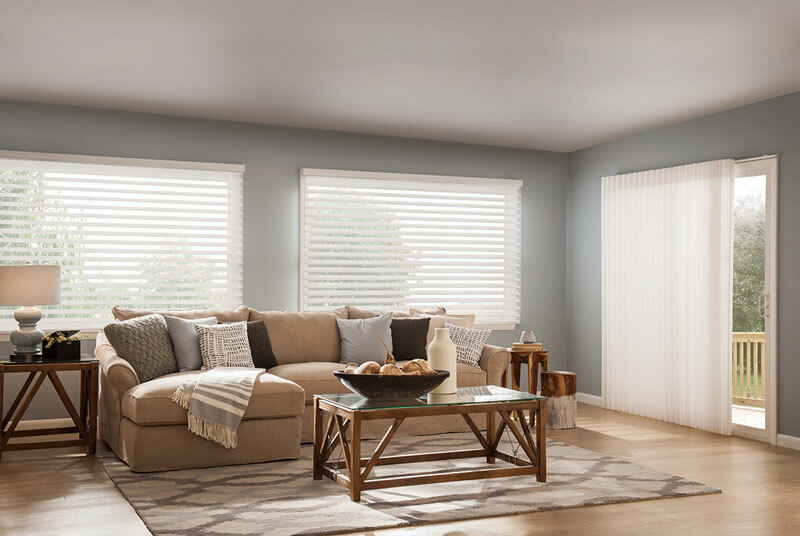 Click on any of the styles of blinds below for more details about each type of shade. Sliding Panel Shades are an excellent choice for sliding doors and large windows. They utilize the many fabric choices used in roller and roman shades, and can be coordinated with them as well. Sliding Panels are a modern and functional way to create a harmony of style in any space. The sleek aluminum track system lets you choose the number of tracks based on the needs of your space, automatically sizing the panels (narrower or wider) based on the selection. They also make excellent room dividers. A decorative cornice/valance can be added for a truly finished look. All Sliding Panel Shades carry a Limited Lifetime Warranty. 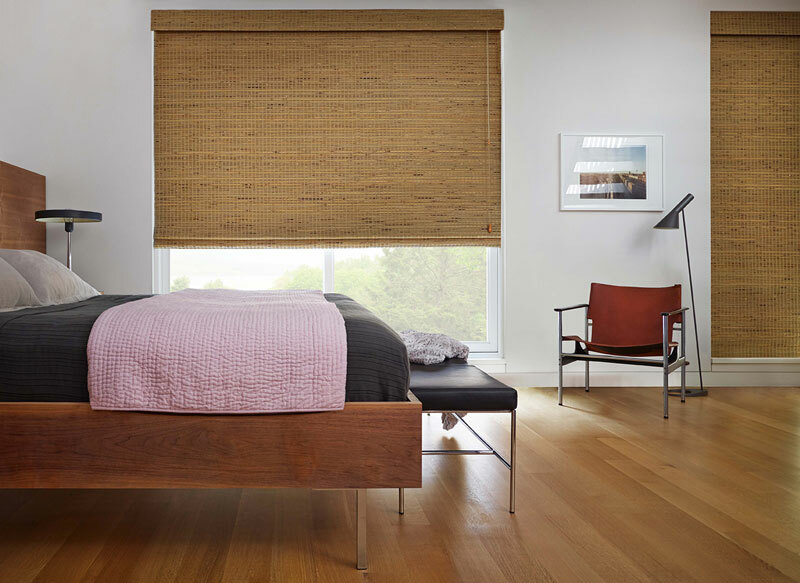 Made from select natural woods, including reeds, bamboos and grasses, woven wood shades are uniquely textured, adding casual good looks to any room. When lowered, these woven wood shades lie flat. When raised, the woven woods hang in even, overlapping folds. Dozens of refined and exotic woven wood styles. Aesthetic, natural material combinations of bamboo, rattan, reeds, jutes & woods offer flexibility in design treatments. The swivel multi-cord lock and guided pulley ensures smooth, long lasting operation. Using a high quality sewing process, optional fabric edge bindings beautifully frame the shade and valance and add a unique fashion accent. Top-Down / Bottom-up or continuous cord loop available. Handcrafted wood tassels and durable pull cords are color coordinated. Optional liners provide additional room darkening and privacy controls. A built-in valance provides added elegance. Material only available for customized accents. All Woven Wood shades carry a Limited Lifetime Warranty. 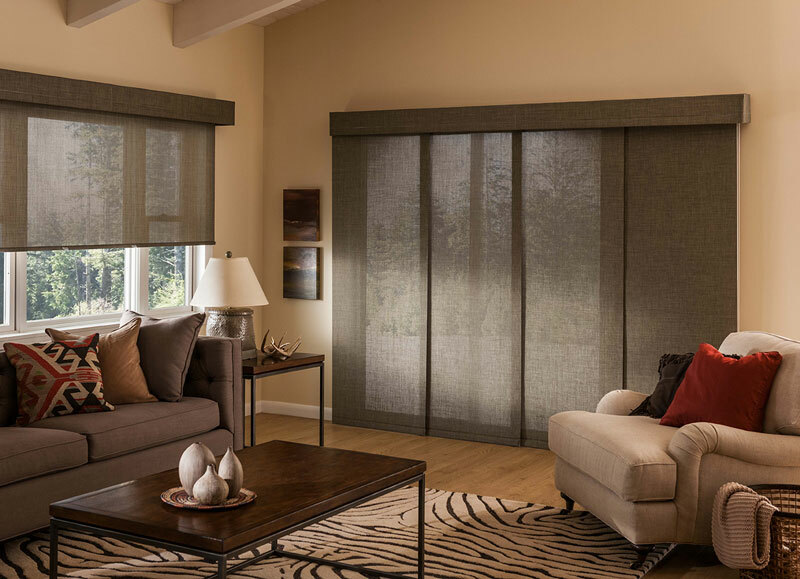 Silhouette Window Shades are the perfect way to provide soft light, elegant styling, and complete privacy to any room. Unites draperies, shades and blinds into one exquisite and stylish window shading design. The shading is made of sheer front and back facings, with fabric vanes suspended between them. Open the fabric vanes, and watch your room fill with a warm, brilliant glow. Close them, and the light becomes more subdued. Or tilt the fabric vanes anywhere in between, and you can treat yourself to any level of illumination desired. Soft 2″, 3″ or 4” vanes in several fabric styles. Precision hardware system ensures lasting smooth and quiet operation. Continuous cord loop lifting system provides smooth operation. Motorization option for high windows. Fabric covered head rail option. The fabric is anti-static as well as stain resistant and will maintain a like-new appearance. All Silhouette Shades carry a Limited Lifetime Warranty. Light filtering Roller Shades / Solar Screens are an excellent option for windows with a view. these shades improve energy efficiency by reducing solar heal gain and blocking harmful UV rays. Blackout Roller Shades are work great where complete room darkening is desired. A variety of decorative fabrics, vinyls, and mesh weaves. Beaded chain clutch system allows for easy lifting and positioning. Optional fabric covered valance or fascia available. Sheer weaves range from 1% openness to 25% openness for a variety of light-filtering effects. All Roller Shades and Solar Screens carry a Limited Lifetime Warranty. Complete selection of 3/8, 3/4, 1-1/4 single cell, 1/2 double cell, and triple cell pleats. Available in popular solids & exclusive prints. Fabrics range from light filtering to total blackout. Top-of-the-line hardware provides smooth operation. Optional “Cordless” or “Continuous Cord Loop” system easily lifts any shade. Optional top-down / bottom-up, or top-down / bottom-up cordless feature. Vertiglide (vertical application) available for doors. Hunter Douglas proprietary lift systems such as UltraGlide, PowerRise, and LiteRise. Skylight applications, specialty shapes and motorization available. 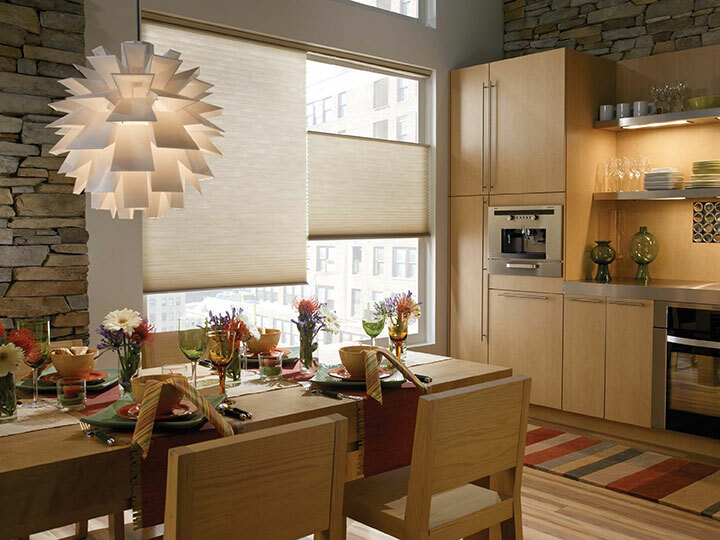 Cellular shades are an elegant window covering for any room. Their unique design insulates your home like no other from summer heat and winter cold, while providing up to 55% sound absorption. Pleated Shades, while similar to Cellular, consist of only 1 layer of fabric. They are useful in applications where having the fabric show the same on both sides. Honeycomb fabric is always white facing the backside. They come in a wide variety of fabrics and styles, and in 1 & 2 inch pleat sizes. All Cellular Shades carry a Limited Lifetime Warranty.